The ADU228 USB Solid-State Relay I/O Interface allows control of 8 SSR outputs, 8 contact or TTL inputs, and 8 event counters via a USB port. 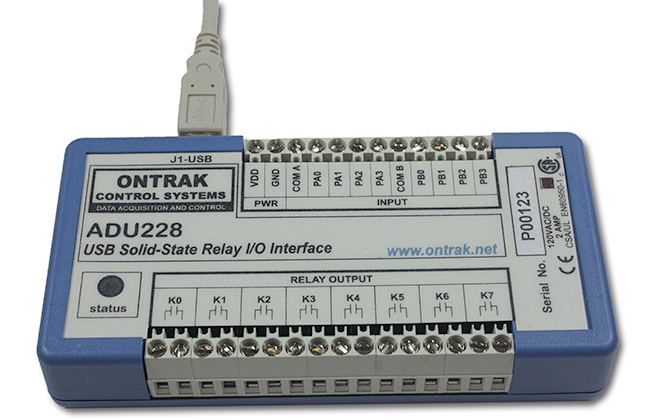 The ADU228 can effectively convert a standard PC to a powerful PLC (programmable logic controller). High quality PhotoMOS solid-state relays switch AC or DC loads. This low-cost serial relay contact interface is easy to use with VB, VB.NET, and Visual C++ via standard HID drivers included with Windows. A mini-driver (DLL) is also provided allowing control using standard ASCII commands using familiar readfile, writefile commands. The ADU228 includes a 10' USB cable and is available as a PCB or in an enclosure with several mounting options. The ADU228 includes a 10' USB cable and a flange mount enclosure. An optional DIN rail version is available. Download ADU228 3D STEP files for FLANGE, DIN and DESKTOP mounting types.